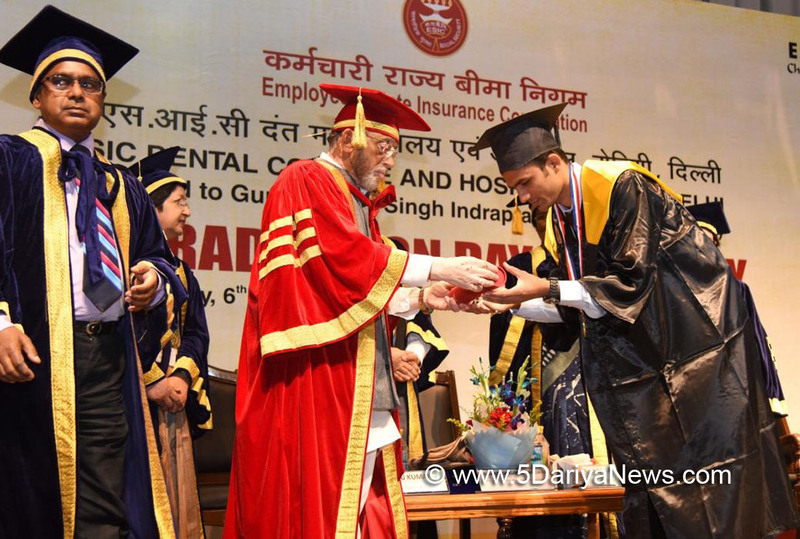 The Minister of State for Labour and Employment (I/C), Shri Santosh Kumar Gangwar awarding the degree to 2011-12 batch students of ESIC Dental College and Hostpital, at Rohini, Delhi on November 06, 2017. Santosh Kumar Gangwar, Union Minister of State (Independent Charge) for Labour & Employment was the Chief Guest of 2nd Graduation Ceremony organized by ESIC Dental College & Hospital, Rohini, Delhi.While addressing the gathering Shri Santosh Kumar Gangwar wished all the graduating students a bright future and congratulated them on their achievement. He said that all graduates should perform their duties in the welfare of the society keeping the professional commitment in mind and serve their best to the country. He further stressed upon the need of extending medical facilities to the workers of un-organised sectors and to the people of the lowest strata of society. He also congratulated Faculty of ESIC Dental College and Hospital, Rohini, Delhi, and parents of Graduating students for support in successful completion of graduation.The Employees’ State Insurance Corporation is a pioneer Social Security organization providing comprehensive social security benefits like reasonable Medical Care and a range of Cash Benefits in times of need such as employment injury, sickness, death etc.The ESI Act applies to premises/precincts where 10 or more persons are employed. The employees drawing wages up to Rs.21,000/- a month are entitled to health insurance cover and other benefits, under the ESI Act. The Act now applies to over 8.73 lakh factories and establishments across the country, benefiting about 3.18 crores family units of workers. As of now, the total beneficiary population of ESI Scheme stands over 12.02 crores. Ever since its inception in 1952, the ESI Corporation has, so far, set up 151 Hospitals, 1467/159 Dispensaries / ISM Units, 813 Branch/Pay Offices and 62 Regional & Sub-Regional/Divisional Offices.ESIC Dental College, Rohini, Delhi under the genesis of Ministry of Labour and Employment, is only the 3rd Government Dental College in Delhi-NCR region. It is constantly striving to develop into an institute of global excellence and repute. The Bachelor of Dental Surgery (BDS) course offered at this institute is in strict adherence to guidelines set by the Dental Council of India and is affiliated to the prestigious Guru Gobind Singh Indra Prastha (GGSIP) University. With quality treatment and value based dental education imparted at ESIC Dental College; ESIC continues to deliver its promises. With quality treatment and value based dental education imparted at ESIC Dental College; ESIC continues to deliver its promises.Smt. M. Sathiyavathy, Secretary, Labour & Employment, Govt. of India, Sh. Raj Kumar, Director General, ESIC and other senior officials also graced the occasion.